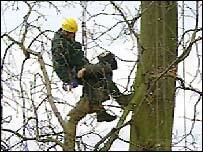 The last of the 31 anti-road protesters who set up makeshift treetop homes in Midlothian has been removed. The environmentalists had taken part in a 10-day demonstration against a £40m bypass planned for the northern section of the Dalkeith Country Park Estate. Transport Scotland said the last activist had been removed by eviction specialists and arrested on Wednesday. The project director welcomed the safe end to the £1m operation but protesters vowed to continue their campaign. Evictions were carried out by a specialist team from Wales under the guidance of a sheriff's officer. Save Dalkeith Park members have claimed the road, which will link the A720 and the A68, will cut through the park and destroy the natural environment. They fear the road will destroy a large part of the park, an area of more than 1,000 acres of farmland and woodland just outside Edinburgh. They said it was a haven for wildlife enthusiasts, cyclists, anglers, horse-riders, walkers and others and that it was visited by as many as 50,000 people every year. However, government agency Transport Scotland said the route was needed to relieve congestion in Dalkeith. A spokesman for the protesters, who did not wish to be named, said: "The road is not due to start contracting until the summer, so the fight is not over. "There is still a legal campaign against the bypass. 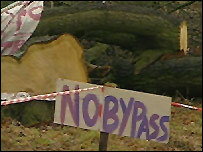 "The protest hasn't saved the trees as yet, but it's brought a lot of awareness, which is good." He also criticised police for their "heavy" approach. A spokeswoman for Lothian and Borders Police said: "It was not a police operation. We were simply there to support the aims of the Scottish Executive. "From a police point of view it has gone very well." Transport Scotland expects the bypass contract to be awarded in March, with work starting this summer and completion by 2008. Both the Scottish Socialists and the Scottish Green Party have called on the executive to re-examine the route chosen for the bypass.